CHEETAHS EVOLVED SOME FIVE MILLION YEARS AGO–BUT ARE THEIR DAYS NUMBERED? For those who are visiting savannah regions, this is undeniably true. Compared to the likelihood of seeing one of the rarer felines, such as a caracal or a genet, chances are fairly decent that the average tourist will encounter a cheetah at some point during his or her trip. The cats will probably be quietly lounging in the sun, resting or digesting, though some lucky visitors may be treated to glimpses of a hunt, or of a mother taking care of her young. 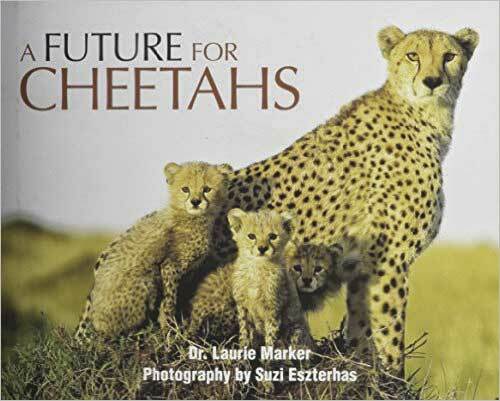 However, as Dr Laurie Marker writes in her book A Future for Cheetahs, cheetah populations are struggling, and humans—tourists and residents both—are one of the major reasons why. Dr Marker, founder and executive director of the Cheetah Conservation Fund (CCF), has over three decades of experience working with cheetahs, and injects her book with her considerable biological, sociological, and management knowledge. A Future for Cheetahs starts with an introduction to the biology of cheetahs, then moves on to a survey of contemporary cheetah research. The remainder of the book analyses cheetah-human conflicts, in site conservation efforts, and the use of sanctuaries and other captive environments, all with the aim of predicting the cats’ future. The scope of A Future for Cheetahs is impressive; even cheetah aficionados are likely to learn something new. Although there is more breadth than depth, the many gorgeous photos are an excellent accompaniment to the text, providing additional insights about cheetahs, their habitats, and their encounters with humans. In fact, the beautiful images are probably the best part of the book, stealing a bit of thunder from writing that is not always as clear, elegant, or even grammatically correct as you might like—especially given that the book costs a not insignificant $45 (a portion of which goes to the CCF). Those who have glanced at the fairly sizeable list of cheetah conservation partners on page 208 might be surprised that the CCF consistently takes center stage, with the photos and text both suggesting that Dr Laurie Marker is the hero of the story. Although this may very well be true, and while the important work of the Cheetah Conservation Fund should by no means be overlooked, the somewhat self-congratulatory phrasing does become a little tedious. That said, A Future for Cheetahs is to be commended for showcasing all of the hard work that is involved in wildlife conservation—the blend of veterinary science, ecosystem management, political maneuvering, captive breeding, campaigning, and more. Detail-oriented readers will also be pleased with the appendix, which provides extra data associated with cheetah biology, scientific methodologies, and conservation plans. The book ends with an honest assessment of the cheetah’s future: Marker writes that “at the current pace, the cheetah is not going to live into too many more generations.” However, as she points out earlier in the book, this is a remarkable species that has successfully recovered from two previous population declines. Conservationists have at their disposal an impressive array of tools that can be deployed to save these magnificent cats. One such tool is the power to educate the public through outreach, and another is to raise money for vital conservation initiatives. A Future for Cheetahs is certainly an admirable bid to achieve both of these important goals. Caitlin Kight is an editor, writer and educator affiliated with the University of Exeter’s Penryn Campus, caitlin.r.kight@gmail.com, http://www. caitlinkight.com.